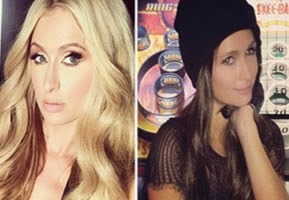 Paris Hilton 33years old, surprised with her new look. She shared some pictures on her Instagram in which she looks brunette and her followers began to ask, "do you dye your hair?". The celebrity Paris Hilton appears today with long dark hair in Universal Studios Hollywood in Los Angeles, with a group of friends that still celebrating Halloween. "What's amazing night!" Says Paris next to the images, which also carries a hat. Why? Also because it's cold, this darling brunette looks through a wig and hat is a good resource to sustain it. Furthermore, it was dark glasses. Thus, Paris Hilton goes unnoticed in public places.Could it be that many people asks for photos ? !